During my visit to Abeille NOLA (my new fav) on Oak Street in New Orleans, I had a great experience and bought two great colorful tops and two fun summer dresses (coming soon!). I also ordered a pretty monogrammed necklace with a pop of color that I can’t wait to feature on Tiny’s Trendy Tuesday (Meg, I am waiting very impatiently!) The owner, Meg O'Reilly, and the manager, Jen, have impeccable fashion sense and help you create unique fashion looks that suit your body type and fashion preferences. 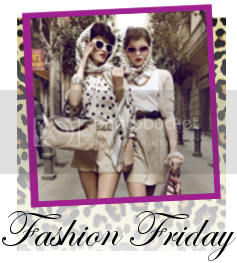 However, they may also suggest some selections outside your everyday style that may surprise you, which is refreshing! It is always nice to dress, think, and act outside your box sometimes! :) Thanks Meg and Jen. You both made the shopping experience even more enjoyable. Abeille NOLA carries unique and local designers, and their very reasonable prices, one of a kind selections, friendly staff, and New Orleans flair make it the perfect place to shop and find something you will not only wear but LOVE! For the summer, I love white skinny jeans with bold colored tops for a pop of color (POC). Skinny jeans are a versatile choice for a variety of tops and shoe choices (wedges and sandals), and I especially love white skinnies for the summer! Because I am short (5'3"), I often lean toward wedges, but I have some great sandals that I love wearing with my skinnies. White skinny jeans are especially fun, because they are like a blank canvas ready for a pop of color, which makes them fun to accessorize! There is so much diversity possible with white skinnies…embrace your creativity and wear them with great fun tops, shoes, and accessories! Now, on to the best part, the TOPS! These bold tops are perfect for summer, because the fabric for both tops feels very light, while providing that pop of color that is quintessentially! The first top is the Jack by BB Dakota Regina linen top in teal ($42, on sale for $30). This top looked great with three different long necklaces, I already had in my jewelry collection. The triple strand beaded vintage necklace was thrifted. The wooden beaded necklace was from Express (old). The gold ring necklace was from the Limited (old). You can find similar long beaded necklaces anywhere right now. Abeille NOLA has some great jewelry. I paired the outfit with some cute gold wedges from Bandolino (Amazon). I wore this top with the triple strand beaded vintage necklace to the SMA benefit at Rock n’ Bowl on Sunday and I received a bunch of complements on it! The second top I truly adore because of the colors and the unique style, especially the back. The top is a striped short sleeve tee from The WISH Collection ($56). It is more of a traditional tee length in the front while the length of the middle piece in the back is longer. It is very different, but super fun! I can’t wait to wear it next week in Cali. The striped pink and grey look great with white skinny jeans, tan wedges, and gold accessories. The very unique top called for minimal gold accessories in my opinion (see below). I love the combination of pink, white, and gold! Side note: Sooper JB refers to it as my shirt with a tail or cape, but his style and mine are a little different sometimes (especially with current styles). 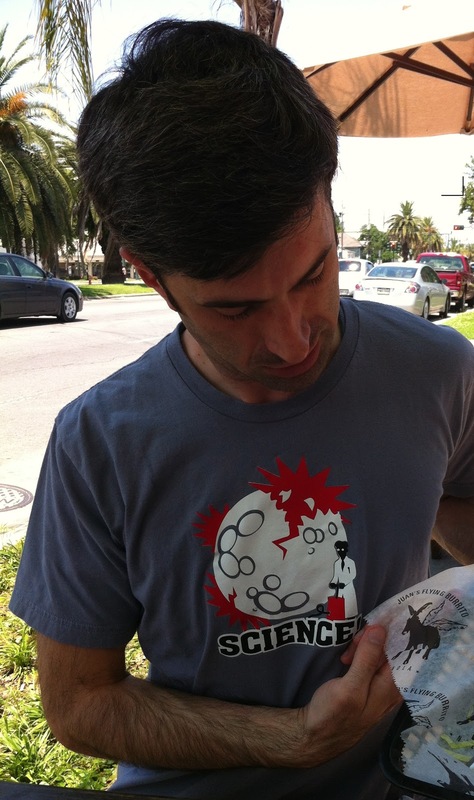 :) His style is the more relaxed and casual look, with funny and interesting t-shirts and plaid shorts (See handsome Sooper in his “Destroy the Moon” Science shirt, see below). For the tops featured in this blog, similar tops, or any great clothing, shoes, and accessories, visit Abeille NOLA and ask for Meg or Jen. They will help make your shopping trip a collaborative experience to help you create the perfect look and also help you find great versatile pieces to add to your current wardrobe. Plus, Shoeffle just opened inside Abeille NOLA so now you have so many great shoe styles to complete your outfit! Visit the shop on Facebook, Abeille NOLA, or Twitter (@abeillenola). 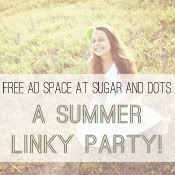 I am linking up with Sarah @ Simply Sarah for her Pink Link-up Challenge! Check out her site and her great style...Love pink, live gold! :) Plus, she loves H & M as much as me! Ok, I am anxious to go shopping there...cant wait...and I cant wait to hear abot this monogram necklace!! Who is The Tiny Librarian? My parents named me Julie, but I am known as "The Tiny Librarian" because of my short stature (5'2") and the fact that I AM an elementary school librarian. I started this blog after completing three graduate degrees (crazy, I know!) and finding myself with oodles of "me" time. Since I have always enjoyed writing, I decided to share my ideas/inspirations with someone other than my sweet husband, Sooper. Besides my enthusiasm for books, especially children's books, I am also a lover of all things family, friends, faith, fashion, food, fitness, and apparently the letter "F". :) Contact me @ juliethetinylibrarian@gmail.com! The Tiny Librarian. Watermark theme. Powered by Blogger.